Friday, August 31st was the start of a holiday weekend and my birthday. 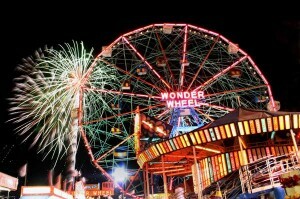 It was also a blue moon and the last time for free fireworks this season at Coney Island. The fireworks lit up the sky and the blue moon cast a beautiful ribbon of light across the water, but both paled in comparison to the delight on the faces of everyone watching. Our joy in life always comes from the little things and wisdom in recognizing what those things are. After all, to see ‘free’ fireworks or a blue moon, all you really have to do is look up. Hoping your holiday weekend gives the opportunity to slow down and enjoy the beautiful world and people around you.